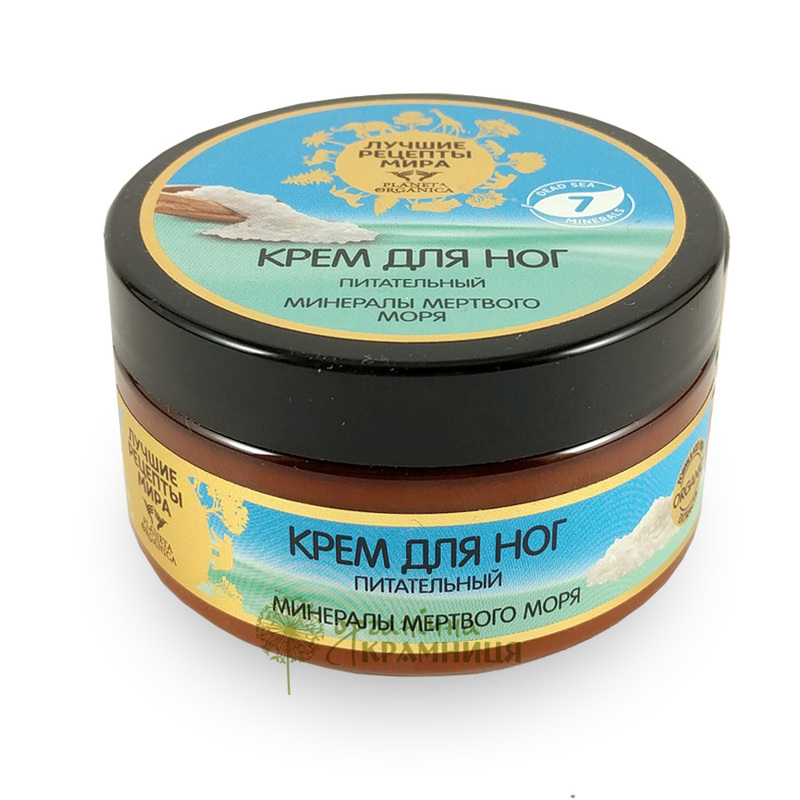 Dead Sea Minerals Nourishing Foot Cream is produced by the Russian cosmetic brand Planeta Organica for its World's Best Recipes series. The cream is formulated with 7 Dead Sea minerals. It deeply nourishes and moisturises the skin of the feet, soothes and softens it, helps to relieve sore feet. The product is free of parabens, silicones and GMO. The key ingredients of the cream are 7 minerals contained in the Dead Sea water. They are calcium, magnesium, zinc, copper, silicon, iron, and selenium. They stimulate microcirculation in the epidermis, provide an antioxidant effect, and help to activate skin regeneration. The cream is enriched with natural ingredients such as shea butter and algae extract. Shea butter, also known as karite butter, is known for its nourishing, moisturising and softening effect. Algae extract helps to keep the skin hydrated, has a detoxifying and regenerative effect, stimulates microcirculation, and provides skin cells with oxygen. Directions. Apply onto dry, clean skin. Massage until absorbs. Ingredients. Aqua with infusions of Laminaria Saccharina Extract, Calcium Carbonate, Magnesium Aspartate, Zinc Gluconate, Copper Gluconate, Selenium, Silica, Iron Oxide, Glycerin, Cetearyl Alcohol, Butyrospermum Parkii Butter, Helianthus Annuus Seed Oil, Isopropyl Palmitate, Stearic Acid, Palmitic Acid, Dimethicone, Tocopheryl Acetate (vitamin E), Benzyl Alcohol, Benzoic Acid, Sorbic Acid, Citric Acid, Parfum. Want to buy Dead Sea Minerals Nourishing Foot Cream? Call us or submit your order via our web site! Planeta Organica World’s Best Recipes is a cosmetic series produced by the Russian beauty brand Planeta Organica known for its high-quality personal care products. Just like other Planeta Organica’s series, products branded as World’s Best Recipes are formulated with natural ingredients imported from all over the world. All World’s Best Recipes products are made in accordance with the key principles of the company: cosmetic ingredients are purchased directly from suppliers from different countries; product formulas are based on traditional beauty recipes from different regions of the world; all products are free from potentially harmful or allergenic ingredients such as parabens, SLS/SLES, phthalates, synthetic fragrances, colourants and dyes; products are not tested on animals (cruelty-free); personal responsibility and thorough quality control. The World’s Best Recipes series comprises over 30 different personal care products for all skin and hair types. They include shampoos, hair conditioners, hair masks, thick bath and shower soaps, body creams and scrubs, shower gels and creams, hand creams, foot creams. Each product is formulated with BIO extracts and oils (both vegetable and essential) and contains certified organic ingredients.